Not many people relish the thought of getting older but, unfortunately, it is something that we are unable to avoid. If you already have some elderly relatives, you probably already know about all the stress and worries that come with caring for them. Lots of families currently try to care for their aging family at home and support them on a day-to-day basis. But what if all of this responsibility becomes too much, and you start to find that you are not coping quite as well as you thought you would? Relatives can worry less knowing that their elderly relative is being cared for by a professional around the clock.Mobility support and help with wheelchairs and hoists. Help with reading and medication. Patience, understanding, and essential emotional support. Help with daily tasks and responsibilities. We know just how stressful constantly caring and looking after your elderly relatives can be, which is why all our employees at Albury Care are more than happy to step into your shoes. Respite care can benefit everyone involved, especially from a care company is able to be there for you 24 hours each and every day. We are always available at any time, no matter what day it is. We will be there for you 24/7, 365 days a year! We continually monitor our nurses and support workers to ensure that they are always giving the best care and support available to our patients. These rigorous checks ensure that we are always one of the best-performing live-in home care services in Guildford. We create specialist ‘care plans’ that are completely tailored to each individual patient’s needs and requirements. This helps all of our employees work to their best abilities. 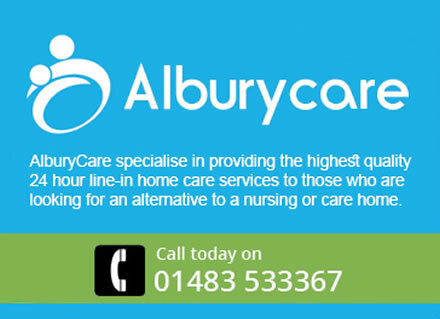 Everyone who works for Albury Care is fully trained and highly professional. Each worker also respects all the views and opinions that they hear. We deal with each complaint and concern quickly and in a highly professional manner. We are also careful to treat each complaint with respect and sympathy. Looking after an elderly relative can be a very testing time for all family members. But there is no reason why this should get on top of you. If you ever do feel like you need a break, reach out to us here at Albury Care to take advantage of our respite care plans. Once you do, you will find that your peace of mind returns in no time, and you can be happy knowing your relative is getting all the attention they require.